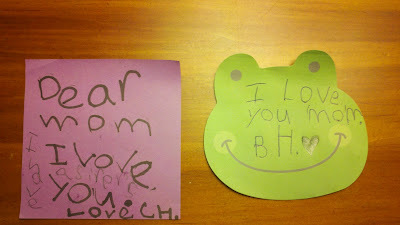 I have oodles of notes that Caroline left me after she went to bed from kindergarten through second grade - she doesn't write them as often anymore. :( When I was cleaning out my night stand a few weeks ago, I couldn't believe how many. I kept most of them and packed them away - most of them tell me how much she loves me along with asking me to come and snuggle with her when I came to bed. So cute! It brought a tear to my eye - it was so cute. Clearly, I will be keeping this one too. I love that he signed his initials too and drew a little heart. I love that they still express their love so openly. And while they are getting older and leaving the little kid days behind, there are new parenting rewards each day as they grow.